Hereford College of Arts Fine Art Summer Show 2018 called ‘Common Room’, is an exhibition of artwork by thirteen postgraduate students of the MA Fine Art course and is open in an unusual venue for showing contemporary art. 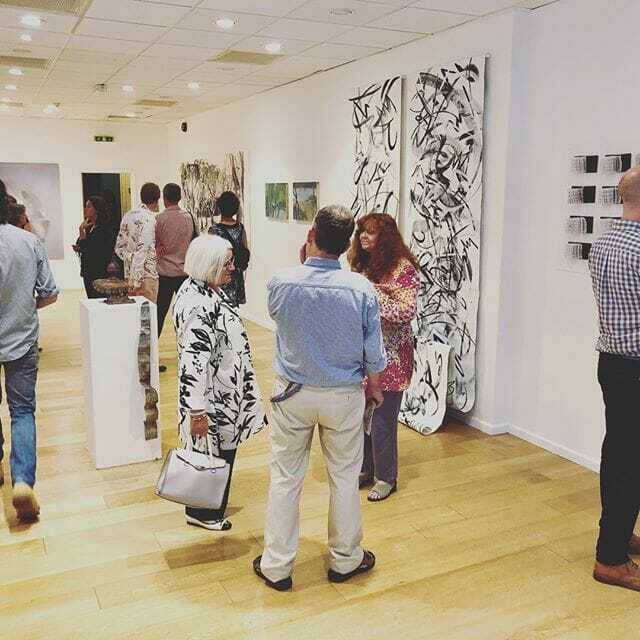 The exhibition showcases diverse multi-disciplinary artistic practice at two pop-up venues in Hereford, in partnership with the Maylord Shopping Centre and Hereford BID and with the kind support of Hereford Cathedral, bringing the students’ work into the heart of the city. See the exhibition at 3 & 7 Gomond Street, Maylord Orchards, Hereford. The title of the exhibition, ‘Common Room’, refers to a shared creative space where the artists come together to swap ideas and make work. This space is now the MA studios at HCA but was once a real-life common room for staff when the building was part of the Royal National College for the Blind and the braille print used on the posters reflects this. When the art students moved in, they discovered a braille sign that remained in place from the room’s previous use and they adopted the title ‘Common Room’ for their shared practice. Artwork shown in the exhibition uses mixed media and interdisciplinary practices – and includes painting, drawing, collage, sculpture, installation, photography, video, projection, sound, and participatory works. On Saturday 21st and Sunday 22nd July at 3pm, several of the artists will talk about their work, explaining some of the ideas behind their practice and the methods involved in its creation. The exhibition and talks are free to attend, refreshments are provided and all are welcome to attend the Private View on Wednesday 18th July at 6pm. The MA Fine Art course is a practice-based programme that enables artists to critically reflect upon, challenge, and refine their work within the context of recent developments in the field of contemporary Fine Art practice. Multidisciplinary in nature, the course promotes engagement, with discourse and debate around the evolving role of the artist within society and the increasingly hybridised ways in which artists work across different disciplines, media, and platforms.